Many people said goodbye long ago to their slide projector and those mountains of slides from the family vacation. But you can still put the slide mounts to good use. The mounts with glass offer even more possibilities. You can make mini framed collages. It's been a while since I played with these. But after @bethstakeonlife and I (@Murkland) conversed on twitter about the creative possibilities, I found this sample to show. And I got a hankering to play more with these. The mount locks together, front and back, and the art parts are sandwiched between. I punched a hole with a regular punch through the front and back pieces of the mount. I painted and stamped the top frame, then coated it with Diamond Glaze. I set it aside. I began working on the collage. I glued hand-painted red paper into the back frame. I layered copper screen on top. I glued on the top frame. I added a face. (I stamped this image onto clear shrink plastic and shrunk it first). Before I went any further, I mounted an eyelet in the hole. 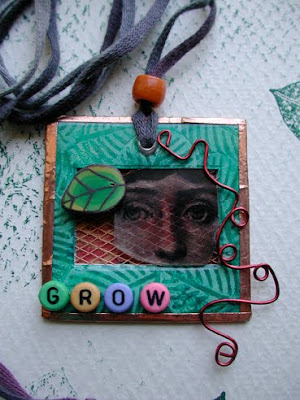 Then I glued a handmade polymer clay leaf bead on top of the collage. I put copper tape around the edges of the frame. I added the twisty wire piece, just because. That was tough to glue. Next I glued on the tiny colored alphabet beads. I threaded some hand-dyed fiber through the hole and made a little funky collage necklace.